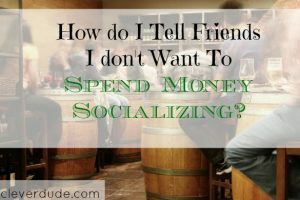 How Do I Tell Friends I Don’t Want To Spend Money Socializing? I received an email from my neighbor inviting me (and others) to meet up for beers. This was the second time in as many weeks he had sent such an invitation. I had to decline the first time because I had a conflict, but to be honest I didn’t really feel like going anyway. But this time I didn’t have anything going on, and I didn’t want my neighbor to think I didn’t like him or didn’t want to hang out with him. It was a Weeknight : My wife and I try to keep our entertainment spending during the week to as close to zero as possible. 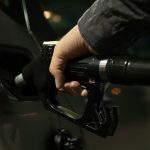 This maximizes our discretionary funds available for the weekend when we have more choices of activities because we don’t have to get up for work the next morning. Waste Of Money : We could have bought a twelve pack of beer and sat on my deck and had the exact same conversation. I overpaid to have someone bring me beer rather than just walk to my fridge and grab one. Uncomfortable : For some, being out in the world socializing brings some level of enjoyment. They like meeting and interacting with new people. I’d rather hang out with my friends in the comfort of familiar surroundings. I fully understand that I put myself in this situation; I didn’t have to go. 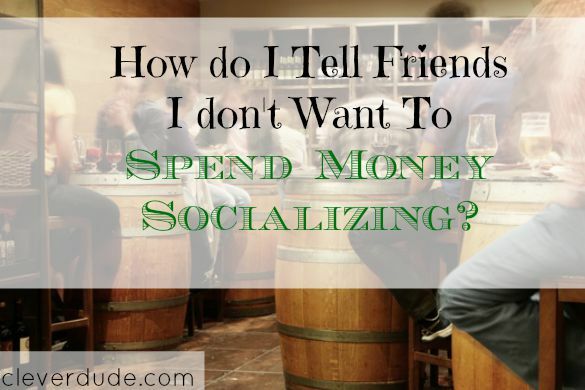 I think we all do things we don’t want to do, and spend money we don’t want to spend from time to time. Coming to the realization that I willingly subjected myself to a situation that I didn’t want to be in, I wondered how could I have gracefully bowed out of the mid-week socializing event? Use Honesty : I could tell my neighbor that I’d like to get together with him sometime, but mid-week drinking just isn’t my thing. Suggest an Alternative : I’d much rather have him, and other friends, over to my home on a weekend night to sit around a fire or to watch a football game. Make it Special : I think it would be neat if each person showing up would bring a different kind of beer. We could still have a variety of beers to try, without having to pay inflated bar prices. Plus, being the grillmaster that I am, I could fire up some charcoal and make us food too! We each have to live with our budget, and deal with the consequences if we happen to wonder outside the lines of the usual spending plan. It’s silly to suffer through things you don’t want to do, and then have to deal with the financial reproductions later. Have you ever spent money doing something you really didn’t want to do? How could you have tactfully avoided it? We are the same way, preferring to go out on Friday or Saturday rather than in the week. I just tell people we can’t afford it, and offer that they could stop by for a beer since we have a keg. The silly thing is the people who want to go out midweek probably can’t afford it more than us. We really can afford it, but doing it doesn’t provide the value I seek in going out. I’ve been there. I have one friend that I see very rarely and whenever we do, he always insists on going out somewhere, usually where prices are inflated because it’s the ‘cool’ place. Since we see each other so rarely, I often times go along with it. I think his rationale is that he gets to be out of the house so rarely that he would rather be out in public versus at home or even in someone elses home. Good article. 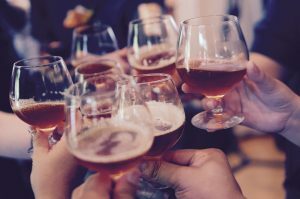 It’s amazing how much a couple happy hours a week, even with discounted menus, can add up to over the course of the month. I like your suggestion of declining and offering something else. Personally, I don’t like to ever say “I can’t afford it”, because it sounds very negative. The reality is we’re choosing to save or spend our money on other things. By offering an alternative, you’re expressing that the friendship is important, but that you just prefer a different venue. @Frugalapolis – I like your use of the word “value.” There just isn’t any value in me going out in the middle of the week. It makes it harder to get up the next morning, and I get up super early to get my workout in. Thanks for sharing your thoughts! @MoneyBeagle – I think some people (extroverts, maybe?) like to be out in the world because it stimulates them. For me, it drains me physically and mentally. I think many also want to meet and interact with new people. I tend to want to simply exert my energy into the relationships I already have. @James – I like how you used the phrase “expressing that the friendship is important.” That’s EXACTLY the message I want to send!